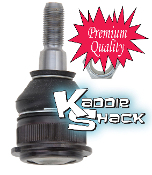 These ball joints are made specifically for lowered or raised bugs where additional wheel travel is needed. 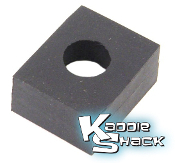 They are specially modified to allow more clearance through the range of the joint. Fits '66 & later bugs. Two uppers and two lowers are needed for each vehicle. 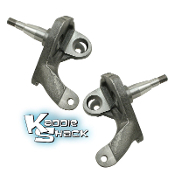 These ball joints are made specifically for lowered or raised bugs where additional wheel travel is needed. 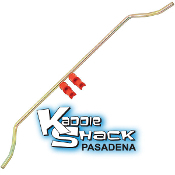 They are specially modified to allow more clearance through the range of the joint. Fits '66 & later bugs. Two uppers and two lowers are needed for each vehicle. 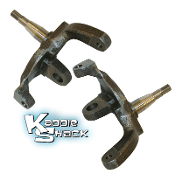 These ball joints are inexpensive replacements for those on a tight budget. Fit '66 & later bugs. Two uppers and two lowers are needed for each vehicle. 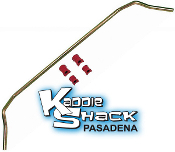 When you raise or lower the front end of your '66 and later Bug, the stock camber adjusters do not have enough adjustment in them to compensate for changed suspension geometry. 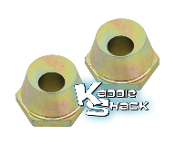 These camber adjusters have the hole drilled at a more acute angle to achieve correct alignment. Sold in pairs. The camber adjusters and ball joints on your '66 and later bug are held in by super-thick washers. 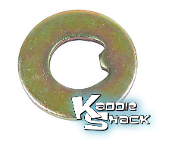 These are the proper hardened and super thick washers to do the job. Sold in pairs. 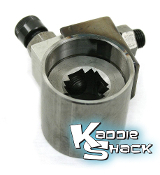 This Sachs Boge steering damper is a direct replacement for your leaky or worn out damper that no longer operates properly. 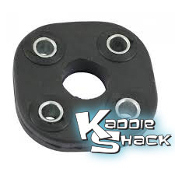 It is common for steering dampers (also known as dampeners) to leak the hydraulic fluid out, causing it to fail. This is the highest quality replacement that we sell. 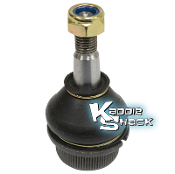 This Cofap steering damper is a direct replacement for your leaky or worn out damper that no longer operates properly. It is common for steering dampers (also known as dampeners) to leak the hydraulic fluid out, causing it to fail. This is a good quality replacement, made in Brazil. 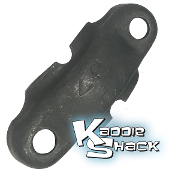 Direct replacement EMPI steering damper (aka dampener) for all Type 1 Bug, Ghia, Thing, except Super Beetle. 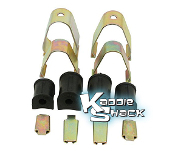 These high quality stainless steel sway bar clamps make sway bar installation a snap! They're much easier and nicer than the stock clamps. 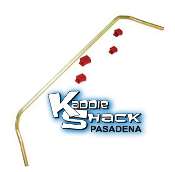 Fits Type 1 front sway bars only. 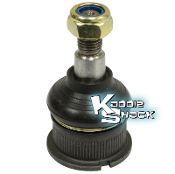 For the absolute best ride quality in most street cars, this KYB nitrogen-filled gas shock absorber would be our #1 choice. The softer ride characteristics will provide the smoothest driving experience. Sold each. We recommend replacing them in pairs. 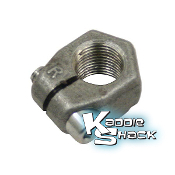 This is the special locking tab that installs underneath the bolt that connects the pitman arm to the steering box. 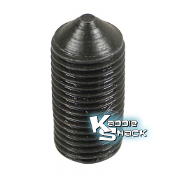 It is folded over the hex bolt to prevent it from vibrating out. We also use red threadlocking compound as an extra measure of caution. The pitman arm connects your steering box to the tie rods. 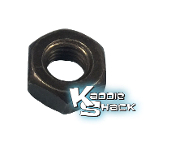 It can wear out due to excessive play in the steering components it connects. If worn, steering can become very loose. Be sure to use a new lock tab when you secure it and check the... The pitman arm connects your steering box to the tie rods. It can wear out due to excessive play in the steering components it connects. If worn, steering can become very loose. Be sure to use a new lock tab when you secure it and check the mounting bolt for good threads. 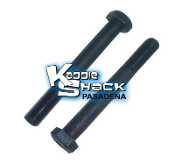 The pitman arm connects to the steering box with a single hardened steel bolt. Need to replace it? 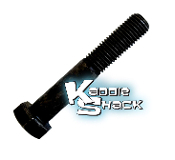 We recommend using a thread locking compound on all front end bolts such as Loctite™ Red. and using the correct lock tab to secure it. 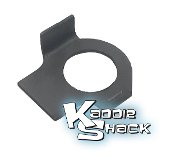 Replacement Steering box clamp for Bug, Ghia, & Type 3. These are the hardened steel bolts and washers that mount the Type 1 steering box to the front beam. Kit comes with two bolts and two washers. Fits all years Standard Bug. 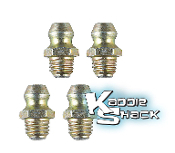 Are the zerk fittings in your front beam damaged, missing, broken off, rusted out, or stripped? This will prevent you from properly lubricating your front end. We have new replacements available in packs of 4. 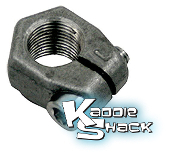 Lower front or rear shock mounting nut, all air-cooled VW's. 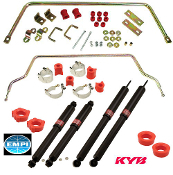 The steering donut that connects your steering box to your steering column is held in place by the female piece in this kit. 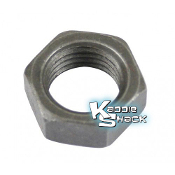 The male piece is provided for those who are fabricating a steering column in off-road car or similar project. 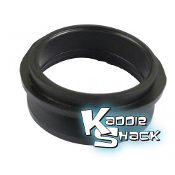 Black urethane replacement steering box coupler fits all Standard Bugs and Type 3's. Comes with hardware. 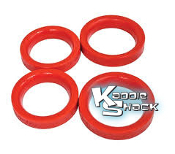 Red urethane replacement steering box coupler fits all Standard Bugs and Type 3's. Comes with hardware. 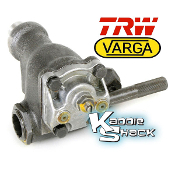 Stock replacement steering box coupler fits all Standard Bugs and Type 3's. 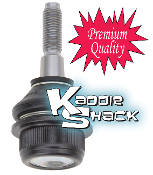 Need to replace the grease seals in your ball joint front beam? These are the stock replacements. Upper and lower seals are different on the ball joint beams, so you'll need to order 2 uppers and 2 lowers. Red urethane beam seals for Type 1 front axle. Seals front trailing arms to beam. Set of 4. This is a rebuilt replacement front trailing arm (also known as a torsion arm) for a '66 and later ball joint Bug. It does not come with a ball joint installed in it. 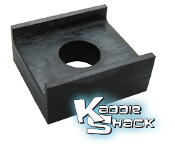 This rubber pad is installed on the top of the body when mounting the axle beam top bolts. It installs between the body itself and the rectangular washer under the bolt. It prevents the body from cracking when it flexes while driving. This rubber pad mounts provides cushion between the body and the pan to prevent cracking when the body flexes. There are two located between the axle beam and the body in the front. 17mm thick.